Do you have the drive and determination to build a successful business that can put you and your family on the path to financial freedom and independence? If you want to be your own boss then you may be interested in our worldwide plan for biohazard distributors. IPS will be establishing distributorships in every major US city as well as around the world. We are just getting started but soon many of the large cities and areas will be purchased and unavailable. If you are interested the time to act is now? IPS is the industry leader in the biohazard and pathogen decontamination business in south Florida and is looking for entrepreneurial minded individuals who want to own their own business and get paid for what they are worth. An IPS Distributorship may be the answer. There are no royalty fees associated with the distributorship. You truely are a separate corporate entity that governs itself. You do not have to follow the rules of the IPS Distributorship but we would hope that you would allign yourself with our outstanding corporate philosphy and business plan. If you want to personalize your corporation and name your company something other than IPS we are ok with that. We give you a proven business plan, training and the proper tools to be successful. With over 20 years of experience, IPS has developed a successful business model that is city based, county or statewide. This is called the Master Program where you can purchase an entire state or geographical area. If you follow our guidelines, marketing plans, commercial networks and training program you will be successful. You can quickly begin generating revenue and profits for your business. There are three options which are identical the only difference is the amount of terratory covered. You get rights to your entire state which guarantees you we will never sell distributorship in your terratory. This gives you the rights to sell the distributorships individually through out your state. You get rights to your entire County with in a 50 mile radius. This guarantees that we will never sell another distributorship within that 50 mile radius. You get rights to your entire city. This guarantees we will never sell another distributorship within that 50 mile radius. After you decide which option works best, you participate in the Distributorships 3 day training program. We will send an instructor to you or you can come to Hollywood, Florida for the orientation and 3 day Distributorship Training Program (DTP). Essentially Recession-Proof — Crime Scene Decontamination and Bio-Medical Waste Pick-up is a growing industry. When you purchase the Distributorship you have the opportunity to partner with one of most respected companies in south Florida. Yes, you heard correctly that you will own two (2) businesses, for the price of one. The two businesses you will own are 1) Biohazard and crime scene decontamination 2) Biomedical box pickup and exchange. We’ve kept our distributorship at a very low cost to you, so you can quickly begin making money and have a profitable business. There will always be a need for a bloodborne pathogen decontamination service due to accidents, crime scenes, suicides, natural deaths, hazardous dwellings, and governmental facilities which need to be cleaned and decontaminated. As the population ages there will also be “hoarding” situations which needs to be sanitized. This industry will only grow as society gets larger and the need increases. When you purchase a distributorship, we will provide you with all the tools needed to develop your own crime scene and biohazard decontamination business. 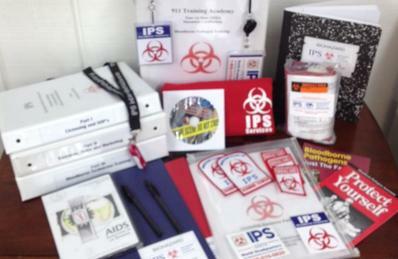 With over 20 years in the biohazard industry, IPS was founded by a former law enforcement officer. Walter Philbrick was a SWAT Team Leader and also a homicide sergeant. Sergeant Philbrick was also the Police Department’s Exposure Control Officer and in charge of the Bloodborne Pathogen Training Division. You will learn from the class instruction how to form a partnership with law enforcement. What does it take to become a small business owner, less capital than you might think? Our in-home model keeps your overhead costs low, allowing you to operate from your home or a small office and even part-time. We have been taking our successful business model into national markets by offering an exclusive license/distributorship in your area. At this low cost the best territories are going fast. Don’t let the low-cost fool you, we will provide you with more than traditional franchises do–and without the high royalty fees they charge. Other benefits include: Minimal start up cost, inexpensive administration fees, minor investment for equipment and a proven business model. With a small up-front investment you can operate your own business. Territorial Distribution rights start at $12,500.00 and we can include additional rights to another territory for $5,500.00 as a package. Ongoing support: sales support, marketing brochures, company website, etc. Marketing support is worth the entire cost alone for our dealership!